This new and trendy "Black and White Patch" Cell Phone Purse was designed to be a showpiece for your most important communications device! It can accommodate larger phones, like the iPhone and the Blackberry, and can also be ordered with a clear plastic display window on the back of purse, making it easy to see who's calling! 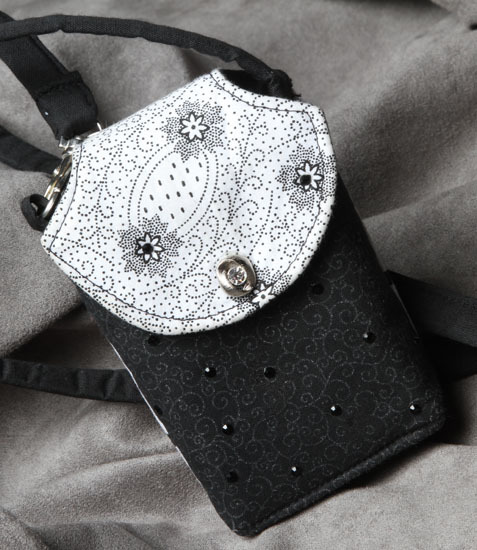 Beautifully handcrafted, this purse is made of cotton print fabric arranged in patchwork,embellished with decorative button, and accentuated with crystals. It is fully padded, has a small front pocket for holding ID, credit card, money, or ear device. Magnetic snap closure on flap holds phone and pocket contents securely in place. Detachable swivel hook with key ring on handle, and long, 46" strap that allows you to wear your purse as a cross-body. Purse size approximately 5"L x 4-1/2" W.
NOTE: Currently, this product style is only available with a 45" long strap, for wearing in a cross-body fashion.